Immersive Ink • View topic - Who Dares Tread in M O R I A ? Who Dares Tread in M O R I A ? Welcome to .~ M I D D L E ~ E A R T H(/size)(/color)(/b) ~. This is The Fourth Age. The War of the Ring is ended two hundred and fifty some years since. The peoples of Middle Earth long celebrated the defeat of Mordor and for a time there was peace and trade, and a rebuilding of prosperity. When the Kings of the Third Age at last went to their ancestors their mighty deeds became but songs and tales, and then only echoes of such. The noblest still strove for diplomacy, but meaner Men soon lost sight of any such perspective. Within scant decades dissension and feuds were already begun, and ere the passing of a third century, a pall of disquiet was cast across the lands of Men. Now, every child has heard the tale in which Gandalf bested a Demon who had despoiled a great city of the Dwarves. But it was never known to even the wisest Men what truly befell the Balrog at Khazad-Dum. What is known is that the vast, dark halls of Moria have ever in this Age been a haven for fell creatures; black-hearted Men, Wargs, Orcs, Trolls and worse. But despite this deadly peril, the lure of Dwarfish silver and glittering treasures of antiquity still draw a steady stream of foolish and greedy Men to those vaults. M O R I A ! This game is set in the Mines of Moria, and in the land of Eregion from which access to the Mines can be had via the Gate of Hollin. 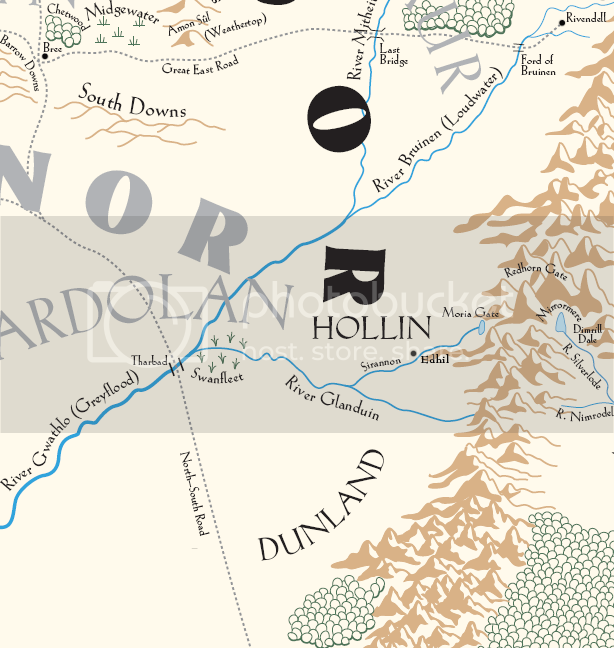 In Eregion (Hollin in the Westron tongue) is the grim town of Edhil. It stands upon the ruins of Ost-in-Edhil, where Elves first came to trade with the Dwarves of Kazad-dum for true silver in the Second Age, and where they learned to craft magic rings... but that was another tale. From Edhil there winds an ancient road along side the Sirannon which leads to the Pass of Caradhra -- said to have once led over the Misty Mountains to Dimrill Dale in the east, though the way is no longer known. The mountain range pictured is the southern Misty Mountains. The Gap of Rohan is a little further south. To those in the treasure hunting business, Moria holds many secrets and much promise. Not only is there Dwarf gold and silver to be found by the bold, but treasures far greater. It is said that in ancient times Edhil was home to masterful Elven smiths and jewellers of that Age who worked tirelessly at their enchanted crafts. If you might doubt the tale, does not the very name of the place Edhil mean of the Elves in their fair tongue? Before these smiths wrought the dread Rings of Power, they also made many lesser rings with varied degrees of sorcery. Some of these, at least, must have been traded with the Dwarves of Khazad-dum... and lie patiently in Moria to this day. Your call will not go unheeded.